UNITED NATIONS, February 10, updated -- When the coup in Maldives was described by UN Secretary General Ban Ki-moon as a "resignation" and "handover of power, which has been announced as a constitutional step," some were mystified. Inner City Press on February 8 and 9 asked Ban's spokesman Martin Nesirky if Ban wanted to amend his statement, once President Mohamed Nasheed said he was forced to resign at gunpoint. Inner City Press also asked Nesirky to confirm that Mohammed Waheed Hassan was, as reported, a former UN system employee. Since another former UN official ran Kyrgyzstan last year, some joked that perhaps Ban was simply lending his support to increased UN relevance, even if through coup d'etat. But soon the US, too, came out in favor of the coup. Close Ban-watchers document the congruence between the statements of Washington then Ban Ki-moon. But in this case, Ban spoke first. Ban's head of political affairs Lynn Pascoe had Maldives on his agenda to brief the Security Council on Friday morning. Pascoe is scheduled to leave and be replaced, Inner City Press has reported, by an Obama administration nominee, probably former UN official and current Homeland Security deputy Jane Holl Lute. So the US is in the UN, but in this case the UN came about before the US in support of the Maldives coup d'etat. A Permanent Representative coming out of Pascoe's briefing told Inner City Press Maldives was describedin the consultations as a "forced constitutional change." Update: Council sources tell Inner City Press that India, in consultations, has taken the same position -- and that France, out of turn, brought up the Monday General Assembly session on Syria first reported by Inner City Pres last night. Inner City Press: On, about the Maldives. Things are now supporters of the former President have started seizing some police stations. But it was described here, as a resignation and an appointment and a handover of power. And now the individuals say, the President, Nasheed, said that he was forced out at gunpoint, and he would like his successor, who he attributes that to, to also step down. 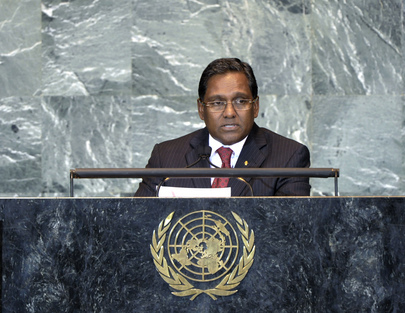 And I understand that his successor, Waheed Hassan, was actually a UN system employee at one point, just for what it’s worth. I am wondering, is there any update to the Secretary-General’s statement that he made yesterday, in light of that it really, apparently, wasn’t a resignation, but in fact it seemed to be an armed coup by a former UN system official. Spokesperson Nesirky: I think if you look at the statement carefully, what it said was that the Secretary-General expresses his strong hope that this handover of power, which has been announced as a constitutional step to avoid further violence and instability, will lead to the peaceful resolution of the political crisis that has polarized the country in recent months. And he calls on all Maldivians to refrain from violence. He still does. Yes, we have seen the reports of violence, and he also continues to encourage them to engage constructively in addressing the challenges that the country faces. And also, as we already announced, the Assistant Secretary-General for Political Affairs, Oscar Fernández-Taranco, is still planning to visit the Maldives this week. Inner City Press: I just… you know, I absolutely… I… I mean, I did… I am looking at it right now, I am just wondering, it is the first… it’s the top paragraph that I am looking at where it says “resignation”. Is it now, or does it remain the UN position that this was a resignation, or was the man forced to resign at gun point? Is that a resignation? Spokesperson: Well, do I have to read that out as well, Matthew? Inner City Press: No, no, I am just wondering, is there an update? Spokesperson: It says “the Secretary-General has learned of the resignation”. I mean, if we want to sit here and parse statements, we can happily do that. But it says “has learned of the resignation”, and it says “which has been announced as a constitutional step”. Clearly, events are unfolding, and that’s one reason why it is particularly timely that Assistant Secretary-General Fernández-Taranco is going to visit the Maldives. Next question? Inner City Press: I want to ask you about again the Maldives, it is becoming more and more clear that it seems to be either a coup the former President, there has now been an arrest warrant has been issued for him and some are saying that the UN statement sort of seemed to give tacit approval to the transfer of power. I’m just wondering if you have any new statement now that the person who was forced to resign at gunpoint has been threatened with arrest. Spokesperson Nesirky: Well, the first thing is the Secretary-General continues to call on everyone there to refrain from violence and engage constructively in addressing the challenges the country is facing. And that was in the statement that was issued. The Assistant Secretary-General, as I have also mentioned already, for Political Affairs, Oscar Fernández-Taranco, should be arriving shortly in the Maldives. And we obviously continue to follow the situation closely. And we are awaiting Mr. Fernández-Taranco’s arrival and his initial assessments before we say anything further. And as soon as I have something further, I’ll let you know. Spokesperson: Just listen to what I said just seconds before you retorted. Spokesperson: As soon as I have more, I’ll let you know. Assistant Secretary-General for Political Affairs Oscar Fernandez-Taranco arrived in the Maldives late today, local time, and held a press encounter at the airport in Male. He said he planned to hold meetings in the coming days with leaders of the government and the political parties, including the newly sworn-in President and his predecessor, as well as civil society. He said the purpose of the visit would be to encourage Maldivian leaders to find ways of stabilizing the situation and moving forward on the basis of dialogue and consensus. He urged calm and a stop to all violence or any action that would further exacerbate tensions. He said it would be critical to avoid retribution against political rivals, and to ensure in particular the continued safety of Mr. Nasheed. He stressed that there can be no externally-generated solutions, and that any peaceful solution in the Maldives must be nationally-led and supported by the people. He expressed the UN's readiness to offer support to a process of dialogue and consensus-building. He emphasized the importance of preserving the democratic gains that have been made in the Maldives.